Washington Business Journal has the scoop on some big news for the block just north of Nats Park, which is that the team behind DC restaurants Succotash and Mi Vida are planning to open The Commons, a 300-seat, 9,000-square-foot, two-story restaurant "that will look into the stadium from its second floor" at JBG Smith's under-construction West Half residential building. And, not only will it have lunch and dinner menus with "a sort of contemporary, upscale diner feel," but it is apparently intending to have a bakery and breakfast operation, Mah-Ze-Dahr at The Commons, from the owners of the New York bakery. The article says that The Commons is aiming for a late 2019 or early 2020 opening. This is the first retail offering announced for West Half, which will have over 65,000 square feet of retail on two floors. All posts: Restaurants/Nightlife, West Half St.
Bakery and breakfast? If there is grab and go, count me in! "To accommodate MLB All-Star fans and attendees of the opening of DC United’s nearby Audi Field, the new restaurant will be serving a limited week-long preview menu of signature tacos, appetizers and a sampling of Mexican entrees. Additionally, the venue’s four bars will be open and serving 16 draft lines: ten for beer, three for wine and prosecco and three for margaritas and cocktails. "Mission Navy Yard will officially open on Monday, July 23 with a full menu of Mexican-inspired dishes from the Dupont location’s menu, as well as new dishes like Frito pie skillet and Pasilla chile short rib." That's a cool looking building. It's a shame that the buildings on Half Street aren't further along for when so many more eyes are going to be on the city and the neighborhood. All of this was predictable (and predicted) though, so I guess there isn't much else to say other than to hope that TV crews are willing to put forth the effort to cover the areas beyond the stadium that are much closer to being ready for prime time. I wouldn't get anyone's hopes up for in-depth news coverage of the neighborhood. "All construction involving public space around Nationals Park will be suspended in mid-July to make way for the more than 100,000 fans expected to attend MLB All-Star Week. "Restrictions will begin on July 10, with a “full work stoppage” in force from July 13-17, Owens said. All work can resume on July 18." 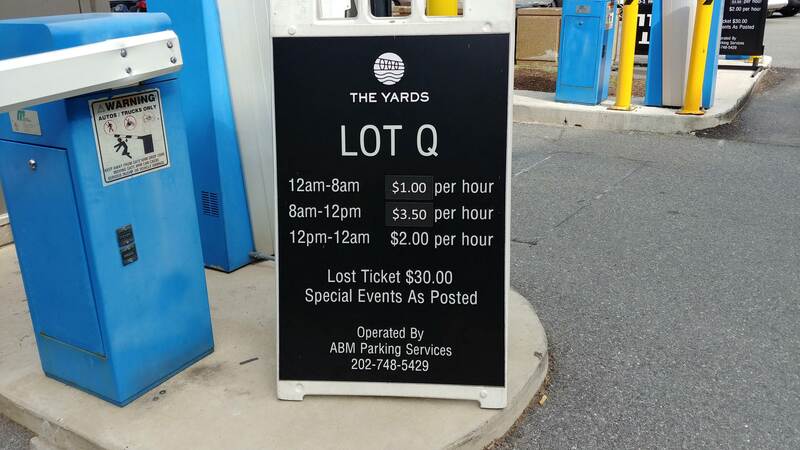 Not sure exactly when this happened, but it seems the Yards lots have switched to variable pricing based on time of day. Lot H/I also does this but has lower rates than Q. Unclear to me if there's a daily max anymore. So it looks like excavation/pile driving has started at Two Mountain North or whatever we're calling One Hill South part 2. So that whole end of the neighborhood is just going to be one big clusterjam for, I guess, ever? Hi JD! Sorry for my awkward hello last night as I walked by you sitting outside at Gordon Biersch. I won’t t tell anyone you were at a bar, because it’s also a restaurant. @FTT, no, thanks for saying hi, I was just not expecting that anyone would be greeting me! Only on the main page now. And marked in the comment threads as well. I will probably work on a show/hide thing so that maybe only the two or three most recent ones are displayed with a click to then see the older ones. JD a few years back there was a proposed apartment project on the westside of S Capitol north of Camden Apts. You wrote about it being on the west side of the DMZ etc. They were going to build around the existing 6 rowhouses south of N Street on S Capitol. Do you have any news on that project? Altus Realty and Ron D Paul Company were the developers back then. Thanks, must be amazing for you to see this all come to fruition! @JeffreyGordon, I have lost track of that project (having a hard enough time keeping up with the east side of the DMZ). Have you checked SWTLQTC? I feel like there was relatively recent news, but I don't know for sure. Sorry! Well...we have Peets on its way, plus Lot 38, plus Starbucks, plus Slipstream, plus....that Australian placing that is coming at some point. So 3 now, plus 2 more on the way? None Dunkin Donuts, alas. I peaked inside Peet's on Saturday when the door was wide open and it doesn't look like they're even close to being ready. I'm not sure why the actual sign got installed so early in the process, but I guess that's also the case for the store-not-to-be-named. @JeffreyGordon, The planned apartment project on the west side of South Capitol Street is on hold. There is a pending application to close an alley that wraps around from N Street to South Capitol which needs to be resolved. This alley closing application and raze permits filed for the row houses already owned by the developer spurred an application by SWNA to nominate the row houses on South Capitol and N streets (some date back to the 1890's) as historic structures. I've included a link to a post from April 2017 about it. The status really hasn't changed much since. This morning on my way in to work I noticed that one of the “storefront” bays on the east side of Nats Park was under construction. Above the door was a sign with an address of 24 Potomac Ave. I couldn’t find anything in the JDLand list of building permits that corresponds to that address. Does anyone know if this is actual retail being built into the stadium or just some temporary construction to support the All Star Game? Also is anyone else seeing the tidbits post? I am on an Android phone using Chrome in this post is the first I see. Not showing up on phones yet. Unless you "request desktop site" in chrome. I am here to gripe that the “Novel South Capitol” totally ruined the fireworks view from 70 I. They couldn’t have run a few weeks behind to prevent topping out before the fourth?! The Forbes article sounds like it was copy/pasted from a Forest City press release and doesn't mention anything outside of Yards Park and Tingey corridor. It seems MLB ASG logos have been painted on the ground around the neighborhood. Not sure when it happened exactly but I noticed for the first time yesterday. I also noticed team names are painted/decaled on the bridge in yards park. I'm going to post an All-Star Game roundup/tidbit catcher probably on Monday. From the tunnel folks: On or about Saturday, July 7th, 4th Street will reopen to vehicular traffic. Work will continue to progress on the street and open-space restoration at the intersection of 4th Street and Virginia Avenue. New paving, granite curbing, sidewalks, drainage and underground work for streetlights are well underway. CSX appreciates the community’s patience while we complete this important work. Haha, it figures that 4th Street will reopen while I’m out of town and not making my regular bike commute. I did notice it looked super close when I took the bypass this morning. Glad it will be back for my return on Thursday! The new concrete barricades at the metro have the neighborhood looking like there's an imminent Russian invasion or something. Any construction progress on the Showplace Icon Theater?